Morphogenesis started recording in January 1985 and our first public performance was at the West Square Festival in London in July '85. The group was formed by a group of people interested in exploring the possibilities of live electronic music and collective improvisation. Its members have diverse musical backgrounds - Ron teaches music technology at Morley College, Adam runs a club for impovised music, Roger wrote books and articles on new music, and we have all played in a variety of other groups ranging from Roger's involvement in Cornelius Cardew's Scratch Orchestra in the 60's, to Clive G's studio work with Nurse With Wound in the 80's and Mike's live and recorded work with Organum in the 90's. Additionally, Adam and Mike are both engaged in solo music production. Clive G. and Mike both have their own CD labels (Paradigm Discs and Mycophile respectively), and Clive G. also has a regular show on Resonance FM each week (playlists for Sound Poets Exposed). The groups aim is to unify and integrate many diverse sound elements, (electronic, vocal, instrumental and environmental) within a context of continual formal evolution and group dialogue. We construct our own instruments in addition to using adapted or prepared conventional instruments - usually violin, piano and acoustic guitar. The range of timbres is further extended by means of filtering and other forms of signal processing. Contact microphones are used to amplify the sounds of bubbling water and other small sounds. All these accoustic sounds are enhanced by electronic filtering etc. One electronic instrument we use is a bioactivity translator which is used to measure the voltage potential of living organisms - including plants, fungi, and the human nervous system - and translate the biological rhythms into electronic sound. Other electronic instruments include a 4 speed portable reel to reel tape recorder and a multi speed CD player, both of which are used to explore short sounds. We do not use laptops or lengthy pre-recorded material. Concert appearances include 2 concerts in Brussels, a WDR recording at the Stadtgarten in Cologne and numerous London concerts, including performances at the LMC festival, The Spitz, The Royal Festival Hall foyer, the Air Gallery and in July 2000 we supported Sonic Youth at the Shepherds Bush Empire. More recently, in 2003 we have played at the Podewil in Berlin and at Instants Chavirés in Paris. Interviews have appeared in EST, Resonance, Audion and Avant, while feature articles have appeared in The Wire and The London Magazine. An online article appeared in March 2005 at Perfect Sound Forever. 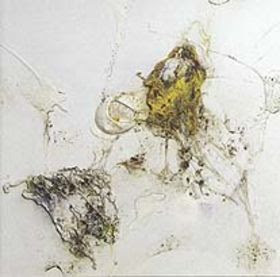 in this recording Morphogenesis were:Adam Bohman, prepared violin, balalaika, objects; Ron Briefel, electronics, sound projection; Fred Sansom, prepared guitar, electronics; Clive Hall, percussion, piano; Michael Prime, water machine, radio, strings, electronics and sound projection; Roger Sutherland, percussion, piano, strings. Recorded in 1986 ,released in 1997 on CD by Mycophile records. I was just the other day mulling the greatness of Morphogenesis; how synchronous that you post one of the few of their recordings that I don't own. Thanks MS!